Becca from California, USA bought some Cubic Zirconia beads from me and I've told her it's CNY season right now in Malaysia so there might be some delay in shipping. 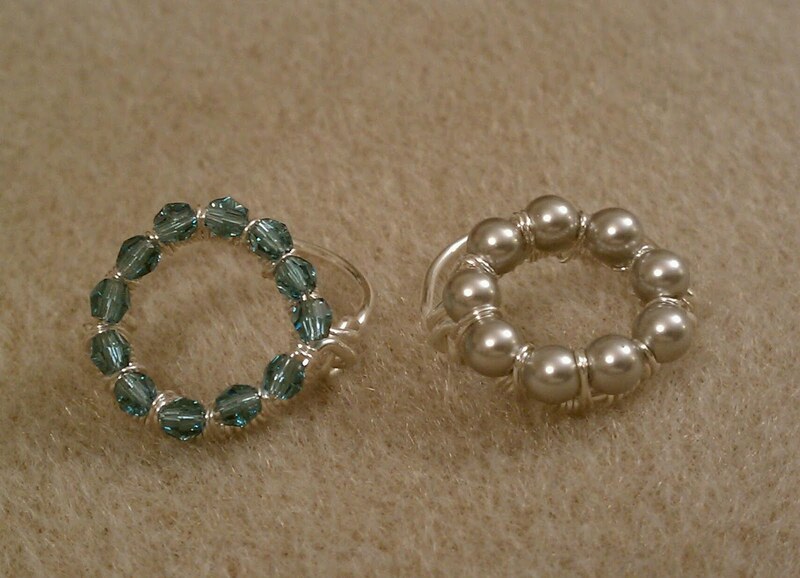 And since she has my Diamond Circle Ring tutorial I told her I will be sending her some chain trim too so that she could try out the project. I did advise her perhaps she could replace the cubic zirconia chain trim with DIY 3mm round beads trim by using 28ga wires to thread enough beads for the project. 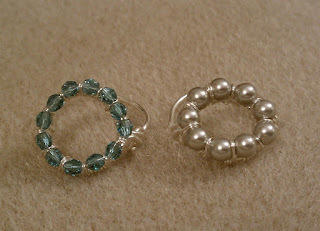 I couldn't help but to try out the ring tutorial as soon as I have time in the evening! 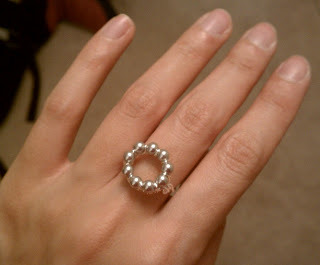 Hope you don't mind, the quality of the pictures aren't the greatest, but it's late and I am too lazy to take my camera out and do the lighting stuff :) I didn't have 3mm pearls, so I used 4mm instead. The crystals were 3mm. I followed the instruction, but it seems like the outer ring was a bit snug. I ended up having to trim a little off from the inner ring to make it flush to the outer half rings. Also, it was hard to get the correct ring size correct since it's not a complete loop (for this ring). 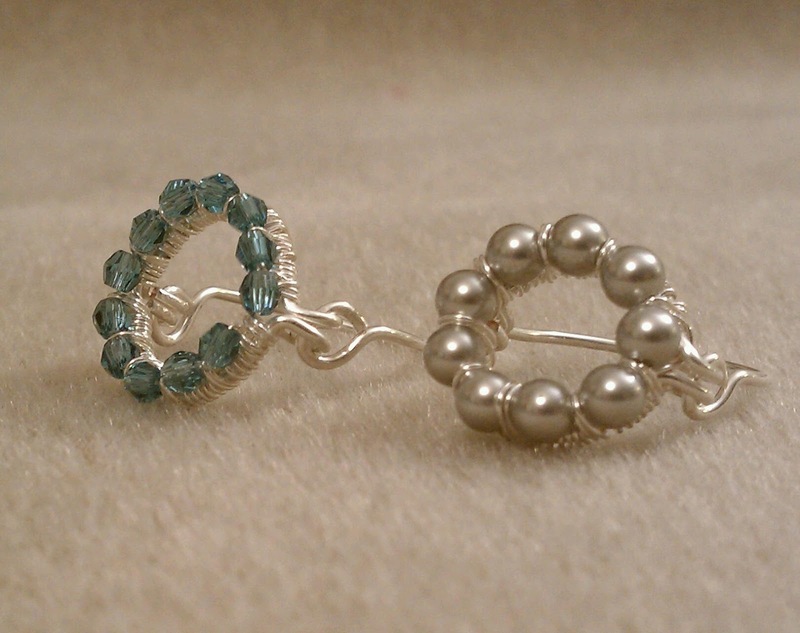 Overall, it was a good practice with wire wrapping and the rings turned out alright. I could see the improvement on the 2nd one. Practice makes perfect, right?! Alright, time to go to bed for me! I LOVE RECEIVING TESTIMONIALS FROM CUSTOMERS! It put a smile on my face though today had been a rough day to me! Thanks, Bex! Her first attempt, 4mm round beads, DIY trim. Her second attempt, I think these are 3mm Swarovski Bicones beads. And Becca told me she is new to Wire Jewelry Making. So I was right about this project is suitable for beginners to try out! 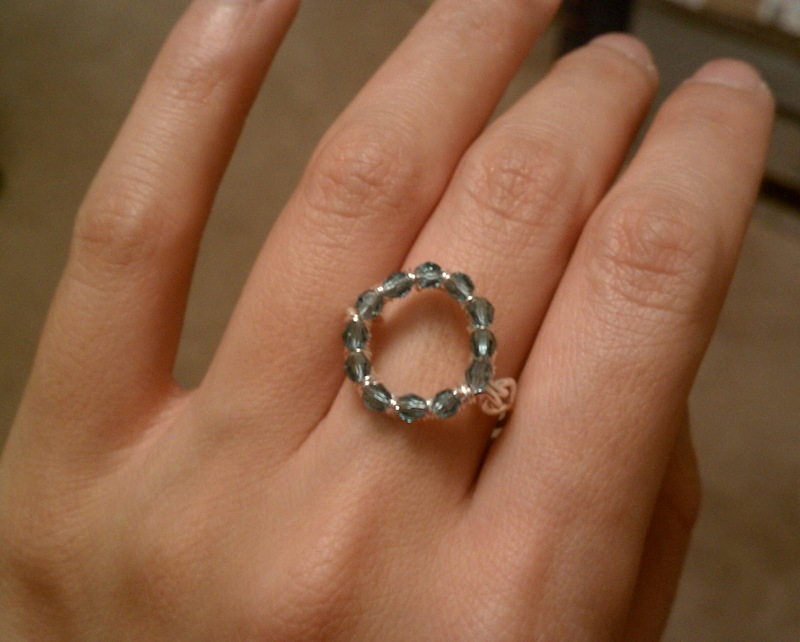 Hope this entry encourages you a little to get your hand dirty for Diamond Circle Ring project too! See ya around!